Mrs Child certainly knew a thing or two about cuisine: from roast duck with orange sauce to simple scrambled eggs, she ensured every meal was a memory. However, a glorious meal can only be truly outstanding if it’s enjoyed in the right environment, and what better place to wine and dine in style than one’s very own dining room? From breakfast to dinner, the dining room is there to accumulate a wealth of different scents, a myriad of different tastes, and a lifetime of memories. We occasionally dress to impress, whether it’s for our boss, our lover, or ourselves. 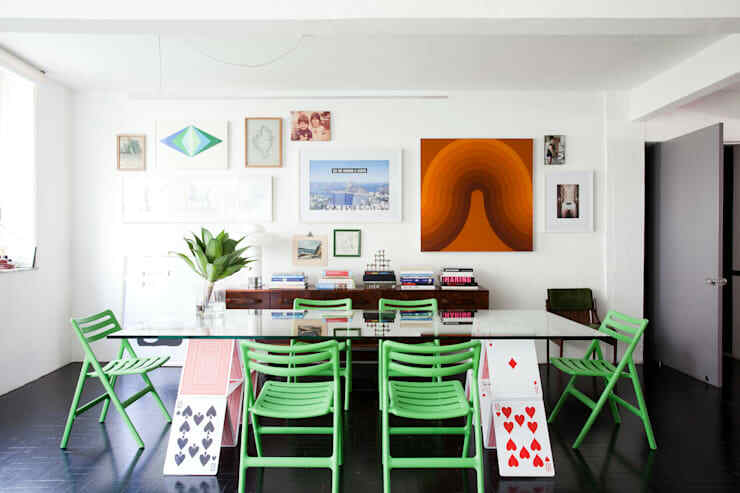 So, why should it be any different when it comes to dressing your dining table? Tablecloths, napkins, placemats, glasses, a good centrepiece, table decor… there really is no excuse for a bland and empty dining table. And forget the excuse of saving space for the meals – even something as tiny as a coaster can add a difference to a table setting. We just love how subtle (yet effective) the above dining space looks! Maria Christina Rinaldi managed to craft a stylish tabletop by using only a handful of accessories and colour. Remember the saying “less is more”? Turns out it’s very true! No need to splurge on the latest and greatest furniture every time the trend changes. Save your money (and your sanity) by investing in a decent dining set that transcends time and trend. 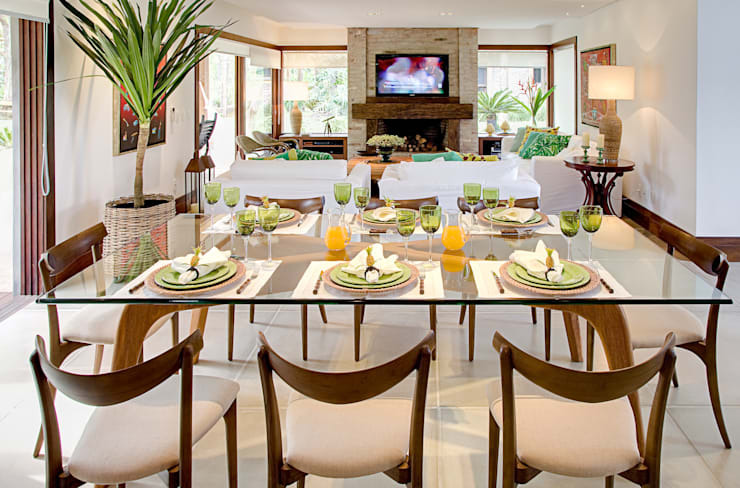 Choose a style which you know you will commit to (modern, Asian, rustic, etc. ), and take it from there. Your furniture can be brightly coloured if you want, although neutral never goes out of style – trust us! In 10 years from now, that white-and-black (or beige-and-cream, grey-and black, etc.) set will still be considered “hot” tone-wise. All you need to be concerned about is that your choice of furniture is strong, valuable, and durable. We find the above layout by Olivia Aldrete Haas simply striking. A combination of earth colours, a set of strong linear designs, and a straightforward style that is neither yesterday nor tomorrow. Please cease contact with anybody who tells you that wall art is for the living room, and nowhere else – one doesn’t need that kind of negativity in one’s life. 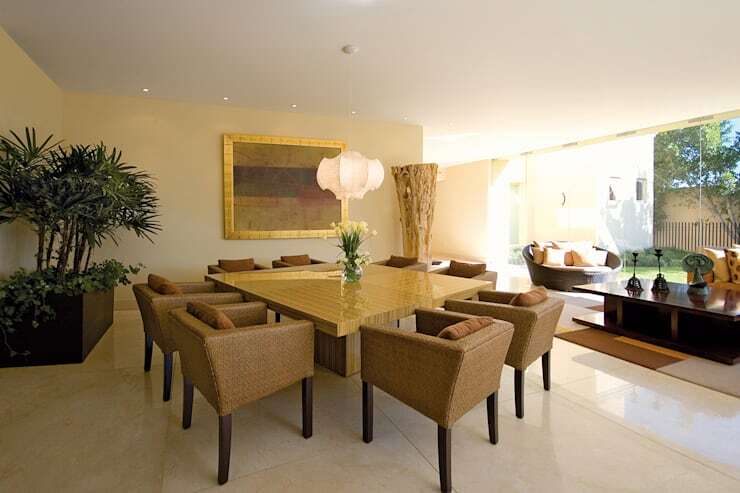 The dining room is a superb place to hang striking pieces of art. Not only can they spice up the place, but they can also serve as conversation topics, especially once the wine starts flowing. From framed black-and-white photography to canvases that display an explosion of rainbow colours, wall art can be the ideal enhancement to accompany your five-star meal. 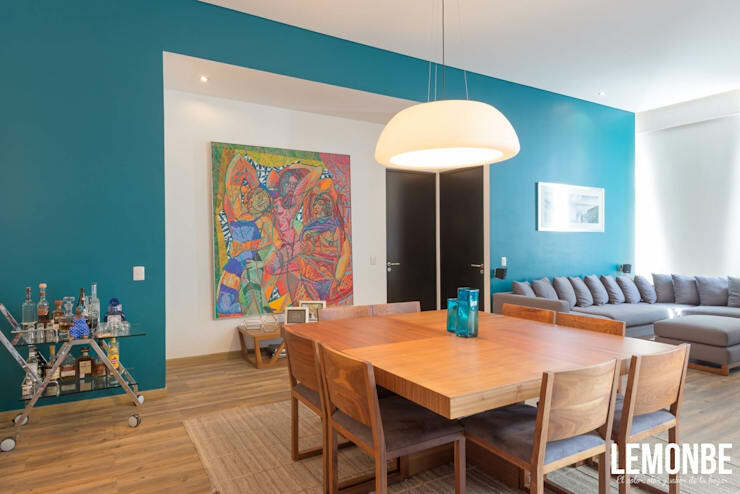 We are certainly of the opinion that the above dining room space by Lemonbe would have been less striking were it not for that vivid art piece against the wall. Its collection of both warm-and cold colours does a splendid job of enhancing the entire room – from blending in with that Gulf Coast blue wall, to contrasting magnificently with the table decor. Here on homify, we are big fans of natural lighting – big windows and glass sliding doors that lovingly invites sunshine and fresh air to adorn the interiors. However, when that is not possible, one opts for artificial lighting – and what possibilities there are! We do not want our guests to stab at their plates with their forks, wondering what it is they’re about to digest. So, we light up our fancy dinner parties to add some flair and character to our delectable meals. HC Interiors certainly agree with us, as they skilfully illuminate that dining area with a strong sense of glamour and style. 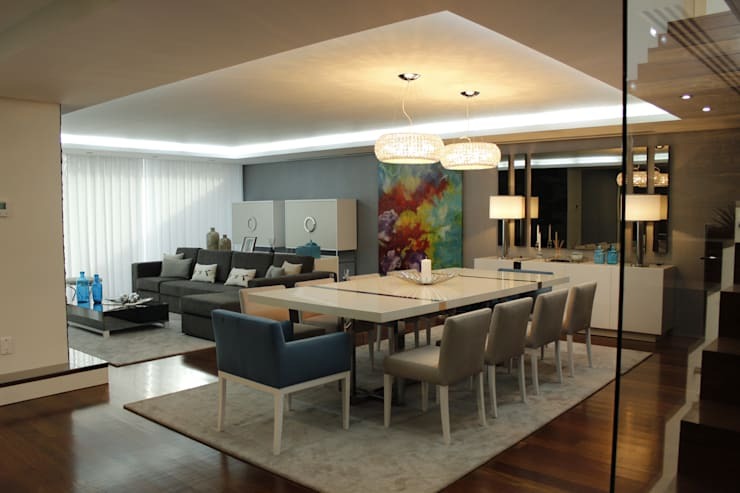 Adding floor- and table lamps are easy enough, but when it comes to installing ceiling-or wall lights, rather put your trust in the hands of an accomplished professional. Architects and electricians know a bit more about wires and fittings, so rather seek out their expert supervision and advice. Want to change a colour aspect of your dining room quickly and easily? Replace the carpet/rug. Painted walls certainly change a room’s ambience, yet too many people overlook the power of a decent rug. 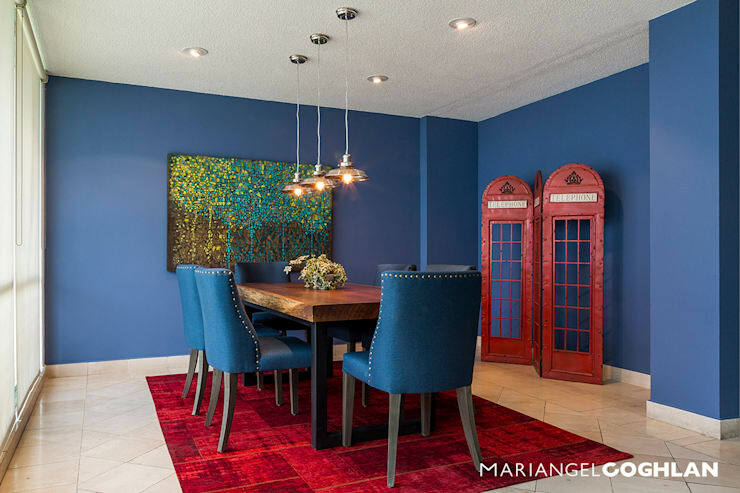 The right rug can link up stylishly with your surroundings, or it can contrast magically with it – as noted by Mariangel Coghlan’s fantastic use of red on blue above. And, of course, adding some decor in the same colour as your carpet is another way of boosting that desired colour. homify hint: We know that spills are inevitable, and the ease with which you can pull a chair back is important; therefore, we recommend flat-weave or low-pile rugs for the dining room. Keep the shag rugs, Moroccan carpets and other thick, fluffy rugs in the living room, where they will require less cleaning and maintenance. Want to know more about the right rug for the right room? Let us help you: Inject some cool into your room with a rug. A modern glass dining table + garden chairs = an 80s retro feel. Interior design certainly isn’t the ideal place for mathematics, yet mixing and matching can make sense if done correctly. •	Getting the same chair but in different colours is the probably the easiest way to achieve this look. This way, there is consistency with the shapes, materials, and styles, yet you experiment with the colour palette. •	If you just want to mix it up ever so slightly, add a pinch of interest by using different accent chairs on the ends. They can either complement or contrast with the rest of your dining set. •	If colour matching isn’t your thing, stick to neutrals. White, black, metals and woods can work brilliantly, either on their own or mixed together. Style is served! What other tips do you have for us in terms of dining room enhancements?